Editor's note: This topic is intended for updates and discussion about space shuttle Atlantis' display at the Kennedy Space Center Visitor Complex in Florida. For general discussion about exhibiting NASA's retired space shuttles or about other venues, please see the appropriate other topics. NASA officials announced today that Kennedy Space Center Visitor Complex has been selected to permanently display space shuttle Atlantis upon retirement of the Space Shuttle Program. Atlantis, one of three orbiters in the space shuttle fleet, will fly the last scheduled space shuttle mission before being retired in 2011. 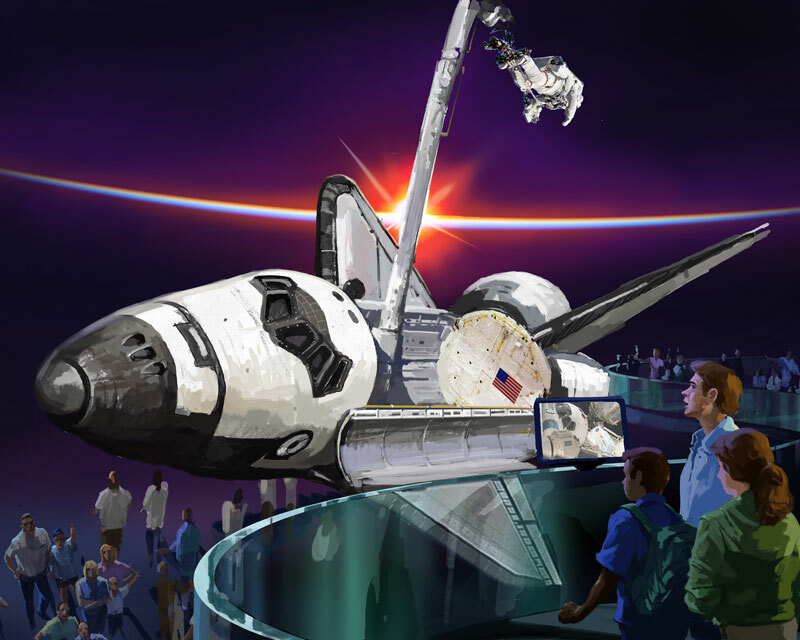 Above: A concept drawing showing space shuttle Atlantis as the centerpiece of a new exhibit showcasing the Space Shuttle Program. The display shows the orbiter in its on-orbit configuration, with the cargo bay doors open and robotic arm extended. "This is a proud moment for space shuttle workers, Brevard County and Florida," said Bill Moore, Chief Operating Officer of Kennedy Space Center Visitor Complex, upon news of the announcement. "We are honored to be entrusted with space shuttle Atlantis, to preserve this remarkable national treasure and share the space shuttle story with millions of visitors from around the world." The $100 million exhibit for Atlantis will be the marquee element of Kennedy Space Center Visitor Complex's 10-year master plan. 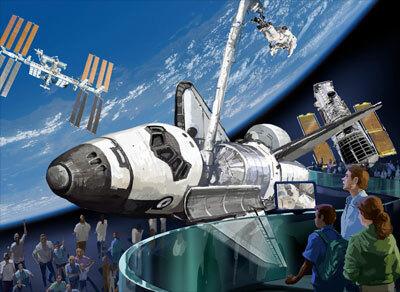 Initial design concepts for the 65,000 square-foot home for the space-flown orbiter include viewing the space shuttle "in flight," showing how the spacecraft worked in space and providing a unique vantage point for guests to look at the complex vehicle up close. Complementing the orbiter display will be interactive features reflecting major accomplishments of the Space Shuttle Program, including the Hubble Space Telescope and the International Space Station. 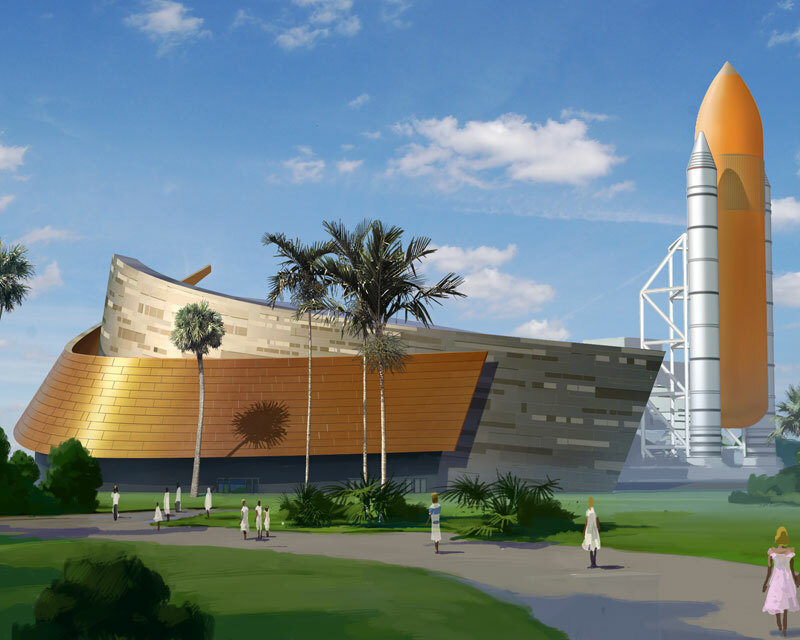 About the orbiter home, Moore stated, "Plans are underway to create a home for Atlantis that is as much about the thousands of people who have worked on the Space Shuttle Program as the space shuttle itself. Guests will be close enough to almost touch this real space flown orbiter." Officials with Kennedy Space Center Visitor Complex plan to break ground on Atlantis' new home in 2012 with a grand opening planned for 2013. The orbiter home will be located in the Shuttle Plaza at the main Visitor Complex; incorporating the Shuttle Launch Experience attraction. I like that you can see the bottom tiles with how Atlantis is displayed. The entire TPS reads like a mosaic of her missions as some elements date back to the first mission. Others are more recent. Still others will only have one flight on them (STS-135). Granted other portions of the interactive exhibits will tell the story, but the most important part of that story will be the old girl herself. That is an interesting graphic of the underside of the shuttle... great perspective. I am also glad to see the ET beanie cap displayed adjacent to the shuttle... that will provide good context. But what is up with those mini-shuttles on the ground floor? I hope that they are shuttle bumper cars... because that would be awesome. From: Olmsted Falls, Ohio U.S.A.
KSC really did their homework in designing a great display for the shuttle Atlantis. I can't wait to see Atlantis in all of her glory. The display appears to be absolutely striking. Where is the $100 million USD coming from though? Just curious. ...funded through revenue generated by visitor admission, food and retail sales at no tax payer expense. The $60 million Shuttle Launch Experience was financed similarly. I'm really glad to see that "Atlantis" will be going to KSC. She was the only shuttle I saw rising into the Florida sky, and I look forward to meeting up with her again after 2013. I just finished reading the NASA Office of Inspector General's review of NASA's selection of display locations for the space shuttle orbiters. In the document starting on page 24 it give some insight as to how the orbiters will be displayed. I thought I would post excerpts from that report here for those who would not have read the report or made it to the final few pages. NASA selected the Kennedy Visitor Complex for placement of Atlantis. After Atlantis returned from its final mission on July 21, 2011, NASA began the after-mission processing and "safing" preparation activities and plans to complete all processing activities required for display by September 2012. Atlantis will then be stored in Kennedy's Vehicle Assembly Building until February 2013, with tour-group viewing opportunities during that period. The Visitor Complex is currently negotiating with Kennedy Space Center officials for an additional storage period at a suitable Center facility until the permanent display facility is ready. 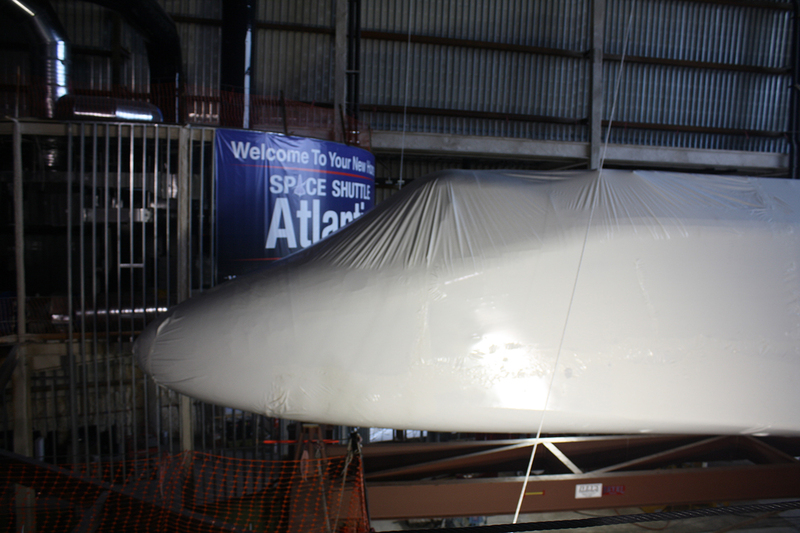 As currently planned, Atlantis will be moved to its permanent facility in February 2013 and will be ready for permanent display in July 2013. 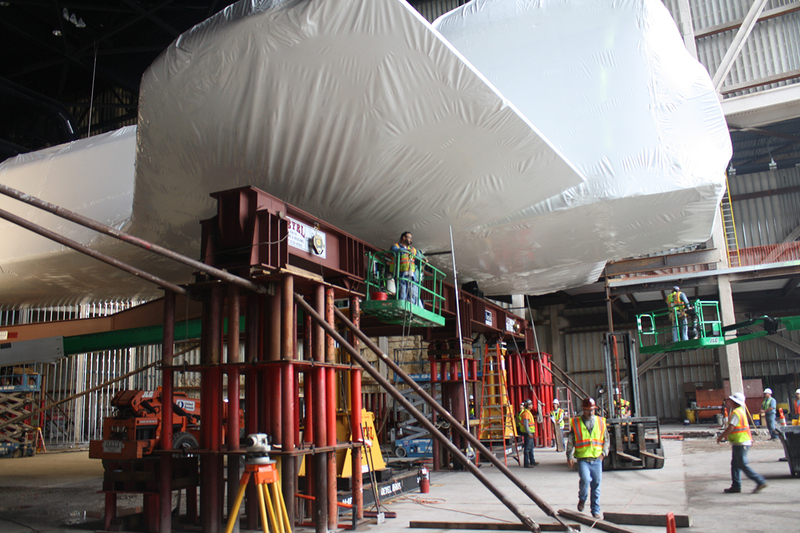 The Visitor Complex plans to display Atlantis in a raised, tilted, horizontal position in its permanent facility. The Visitor Complex submitted its logistics plan on August 5, 2011. The exhibit and finance plans are due by the end of August 2011, and initial funding is due in February 2012. Construction workers at NASA's Kennedy Space Center Visitor Complex in Florida began clearing a path Tuesday (Nov. 29) for the arrival of space shuttle Atlantis, which is slated to go on display there in 2013. Employing a pair of large cranes, workers from Beyel Brothers Crane and Rigging lowered the first of two 100,000 pound (45,359 kg.) solid rocket boosters (SRB's) off of its exhibit stand and onto a transporter. Over the next couple of days, the construction crews will remove the second booster and an 87,000 pound (39,462 kg.) external tank that for more than a decade has been on prominent display at the Visitor Complex. 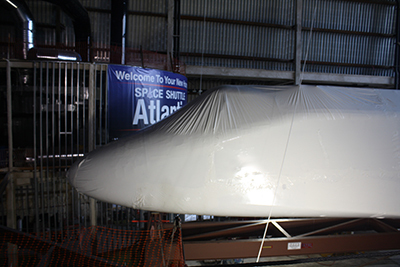 Our NASA's Fla. visitor center clearing way for Atlantis' arrival image gallery has now been updated with photographs showing the second solid rocket booster and external tank being removed. The ET and SRB's will be going to L.A. along with Endeavour. The California Science Center has won a new companion exhibit to the space shuttle Endeavour: the shuttle's external tank and twin solid rocket boosters. The tank –- the orange cylindrical structure affixed to the shuttle's belly at launch –- and twin solid rocket boosters had been displayed at the Kennedy Space Complex visitors center, officials told The Times last week. 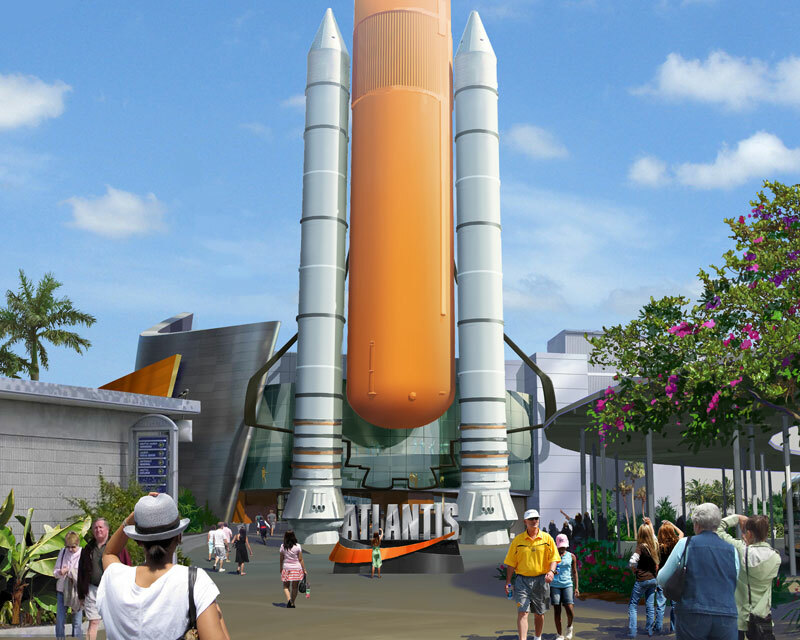 NASA's Kennedy Space Center and Delaware North Companies Parks & Resorts will conduct a ceremonial groundbreaking at the future home of the space shuttle Atlantis exhibit at Kennedy Space Center Visitor Complex. This ceremony will mark the first time a space shuttle recipient has broken ground on a new, permanent exhibit dedicated to displaying a flown orbiter. The $100 million, 65,000 square foot exhibit for space shuttle Atlantis will be the marquee element of the Kennedy Space Center Visitor Complex's 10-year master plan. 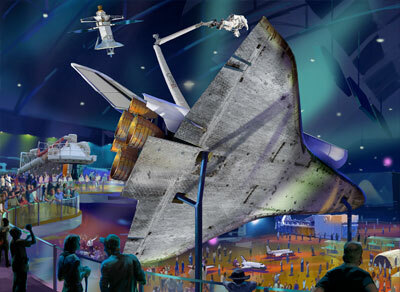 The Atlantis exhibit will tell the story of the 30 year Space Shuttle Program, while providing a unique vantage point for guests to look at the complex vehicle up-close. The final astronaut to lead a space shuttle mission returned to his launch and landing site on Wednesday (Jan. 18) to help in breaking the ground for his spacecraft's future public display. Chris Ferguson, who commanded the final flight of shuttle Atlantis last July, joined NASA and Florida state officials at the Kennedy Space Center Visitor Complex near Cape Canaveral for a ceremonial ground breaking for the $100 million, 65,000-square-foot exhibit dedicated to the retired winged orbiter. The ET/SRB sculpture with an outline of an orbiter is beautiful! What a great idea. 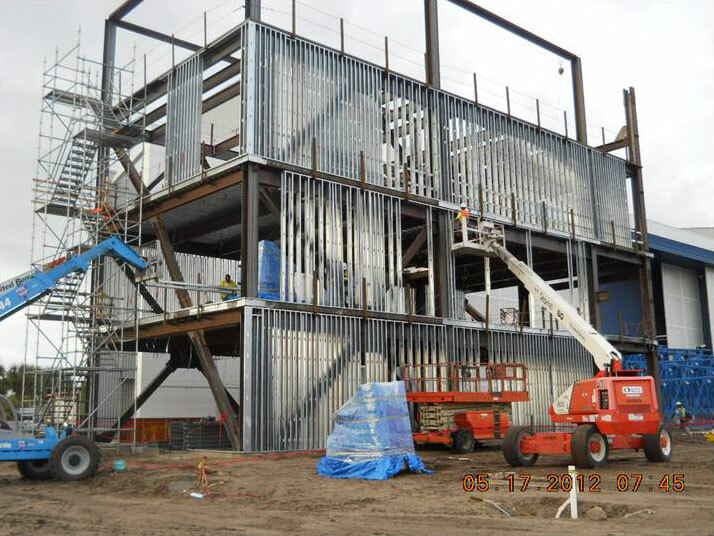 The Kennedy Space Center Visitor Complex now has a time-lapse camera view of the construction of its Atlantis exhibition building. I would like to know how they are going to open Atlantis's payload bay doors and keep them open. Since they could only open them in the OPFs or at the pad in the payload room. 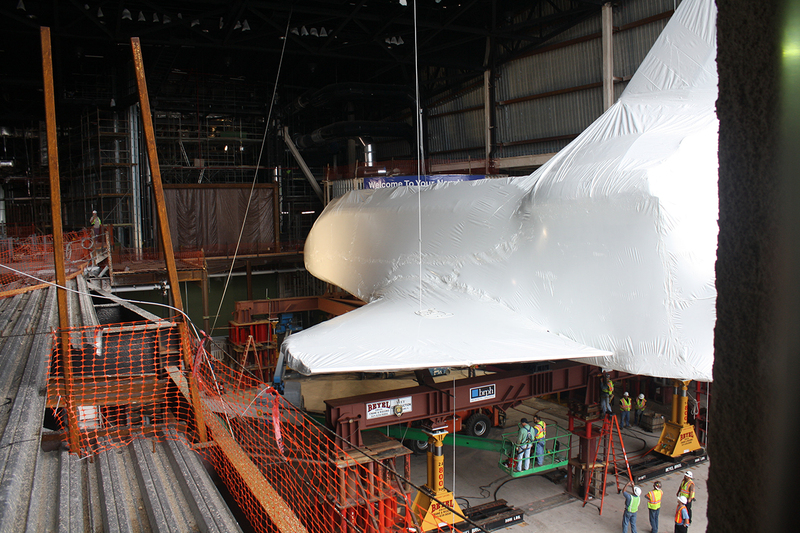 Atlantis gets moved on November 2nd, and the exhibit doesn't open until July 2013. Does anyone know if the public will be able to see it at all from Nov. 2012 till July of 2013? My understanding from speaking with the Visitor Complex is that Atlantis will not be accessible until the opening of its exhibit. They will erect the fourth wall of the facility after Atlantis is inside and the next time the orbiter will be visible to the public is when the exhibit doors open. I can't help but notice the people behind the orbiter in this painting, the artist who created this seriously misunderstood the size of the Atlantis in scale with the people! What is the lifting method they will use to mount the shuttle on its viewing pedestal if roof is already in place, i.e. no overhead crane available? With the SRBs that were on display at KSC now moved to California, where will they get the display SRBs for the Atlantis display? Or are they building new replicas from scratch? 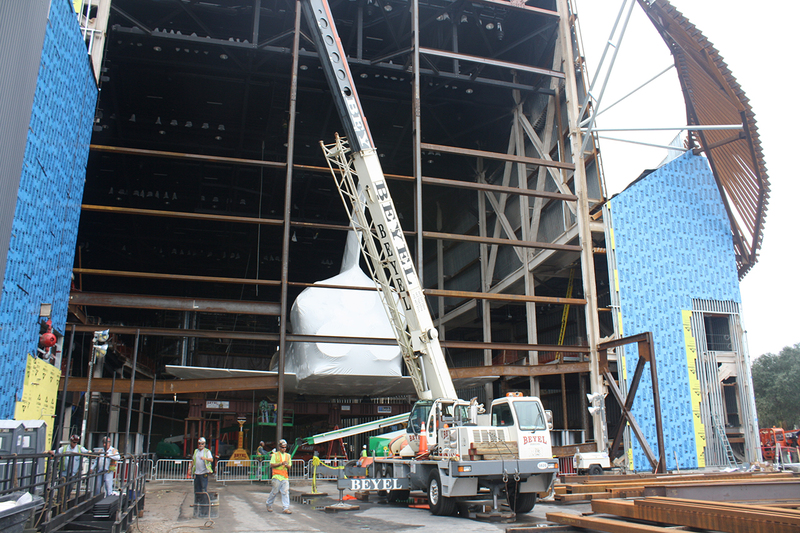 The Visitor Complex is fabricating fiberglass replicas for the new exhibit. So, will the ET be a replica as well? Yes, also out of fiberglass. The external tank that was on display at Kennedy earlier is moving to the Wings of Dreams Museum, also in Florida. ...Wednesday's topping out ceremony at the Kennedy Space Center Visitor Complex celebrated the overall completion of a 90,000 square foot exhibit building to display space shuttle Atlantis. The event included the lifting of the final building beam to the top of the orbiter home, eight months after first breaking ground. The external airlock/docking system mockup that was installed in Atlantis today looks extremely high-fidelity, particularly the outer insulation. The only thing I can see wrong with it at first glance is that the grey insulation on the docking system looks very off. Was any real hardware/insulation used in its construction, or was it completely fabricated by the visitor's center? 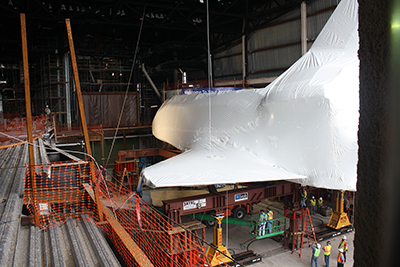 Editor's note: For details of Atlantis' delivery to the Kennedy Space Center Visitor Complex on Nov. 2, see this discussion thread. Now that Atlantis is inside its new (soon-to-be-named) exhibit building, the Kennedy Space Center Visitor Complex is offering its guests the opportunity to take a "sneak peek" at the orbiter in its new home. I was there most of the day yesterday and saw nothing of the "Sneak-a-Peek" tour. I wish I would have wandered over there. I even overheard a fellow ask one of the security officers if it was possible to see Atlantis and was told that "no the building was a construction zone." I hate that I missed that chance. I was there most of the day yesterday and saw nothing of the "Sneak-a-Peek" tour I wish I would have wandered over there. Maybe you should have wandered over because the tour must be taking place. A poster on CruiseCritic.com went yesterday and posted two photos located about half way down the page. If you can go back, I would. It's something to see. The "Sneak-A-Peek" tour wasn't announced until the day of the move, and then not until later in the day. It doesn't seem to be on the visitor complex website yet, either. I was at the visitor centre on Saturday and only after taking a trip out to the Saturn V centre the bus driver announced on the way back that any person was able to take a sneak peek at the shuttle. When I got off the bus I walked towards the building that was under construction, even then I thought it was a dead end and walked through a couple of emergency exit door until I reached the shuttle sitting in a construction site. I counted the people inside and it was a total of six people an me, it was a fantastic feeling standing in front of the shuttle. If it wasn't for the bus driver I would of never even considered going to the building. 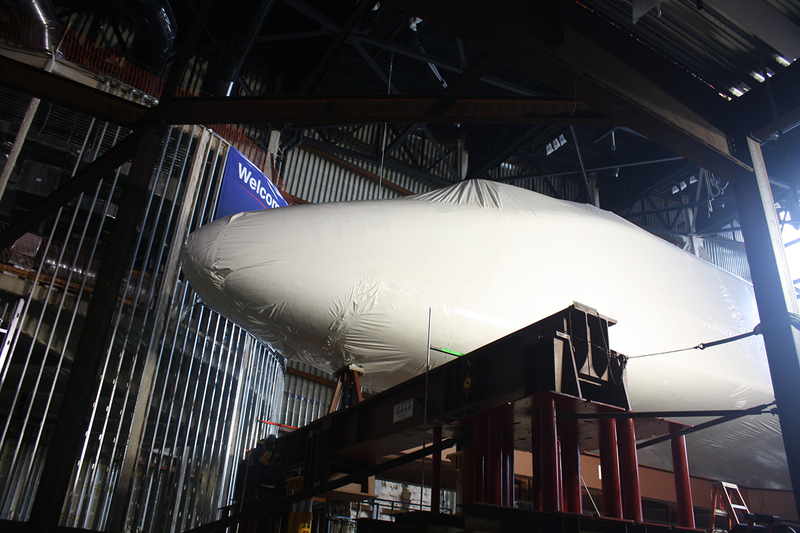 The rumor I heard was that Atlantis was going to be bubble-wrapped. I was looking forward to squishing all those millions of bubbles. But it was only shrink-wrapped. Pretty interesting! I really appreciate this kind of behind-the-scenes information (especially the pictures) you really only get on this site. Between the earthquake absorbers for Endeavour, and this type of care for protecting Atlantis, it's remarkable how well these facilities are caring for these national treasures. Great pictures as always. 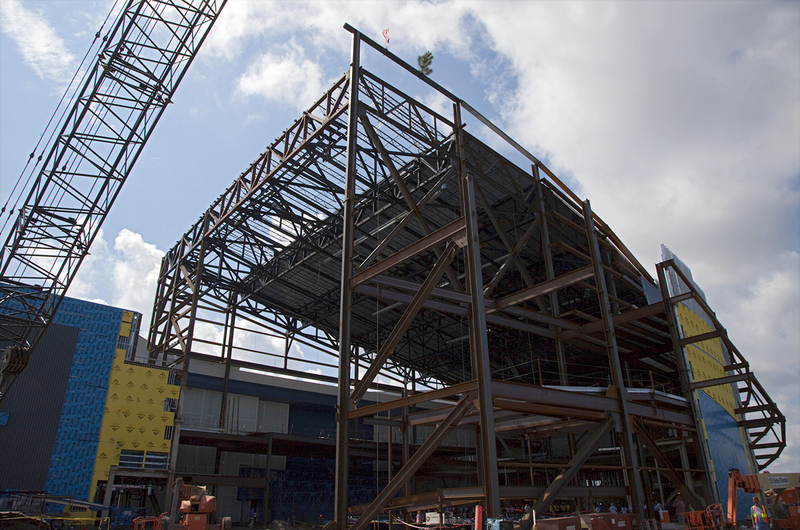 I cannot wait to see this in person when it is completed.